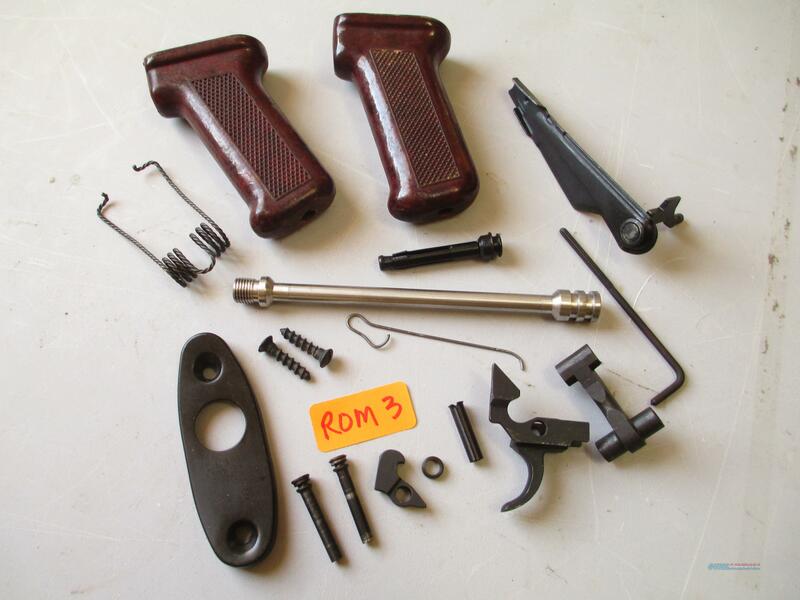 Description: ROMANIAN PARTS .....ALL NEW PARTS .........BROKEN SHELL EXTRACTOR 7.62 X 39..... US MFG. SS STANDARD GAS PISTON MEASURES 6.25" .... U.S. Sec 922r compliant part * Made in the U.S.A. ........NEW BUTTPLATE WITH 2-NEW SCREWS......GAS PORT CLEANING TOOL ................................................................................................... USED PARTS.....SAFETY SELECTOR.. ....HAMMER SPRING.....2-AXIS PINS......SHEPPARD HOOK..........2 -PISTOL GRIPS.......SEMI AUTO TRIGGER ...SEAR....HAMMER ....SPACING WASHER ....TRIGGER SLEEVE.......(THE TRIGGER GROUP PARTS WERE TAKEN FROM ASSEMBLED IMPORTED RIFLES THAT WERE PARTED OUT HERE IN THE STATES AND SHOW ALMOST NO SURFACE WARE...).